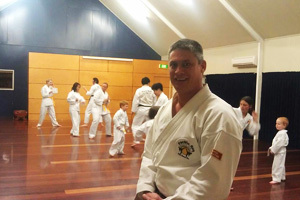 The North Shore branch of Pacific Sun Taekwondo is led by Senior Instructor Barry Miller (4th Dan) and offers a safe environment in which to train for self-defence, fitness and self-confidence. Senior Instructor Barry started Taekwondo in 1994 after several years in other Martial Arts and found traditional Taekwondo to be best suited to his physical and mental nature. Classes are conducted each week on Monday and Thursday Evenings at the Taitamariki Girl Guides Hall in the Auburn St Reserve of Takapuna, from 6-7pm for Children and 6-8pm for Adults.